A roar of laughter was followed by applause for the Oakland-based comedian and emcee of last Sunday’s fest that features short films portraying disability and its various facets of diversity, intricacy and empowerment. The Paul K. Longmore Institute on Disability celebrated its second year hosting the volunteer-based festival at the Contemporary Jewish Museum in downtown San Francisco last Sunday. The Institute is SF State’s in-house organization located on the first floor of the Humanities building. Assistant Director of the Institute Emily Beitiks worked with Director Catherine Kudlik and Executive Director Bryan Bashin of Lighthouse, an organization for the blind and visually impaired, to bring Superfest to San Francisco. Beitiks said people were surprised that Lighthouse was affiliated with the event. “Blind people are running a film festival? What?” Beitiks joked. The festival accommodations were ensured to be accessible for people of all types of disabilities. Two sign language interpreters, closed captions and audio descriptions were provided at Sunday’s event to help the audience watch and hear each movie. The films featured people who were born able-bodied and later became disabled, as well as people born with disabilities. The first movie, titled “The Limbless Mountaineer,” starred Jamie Andrew, a man who lost his friend and all his limbs due to frostbite while climbing the Matterhorn mountain in the Pennine Alps. The movie covered Andrew’s rehabilitation and dedication to climb the mountain once again despite numerous setbacks. However, the film ended with his retreat before reaching the summit. 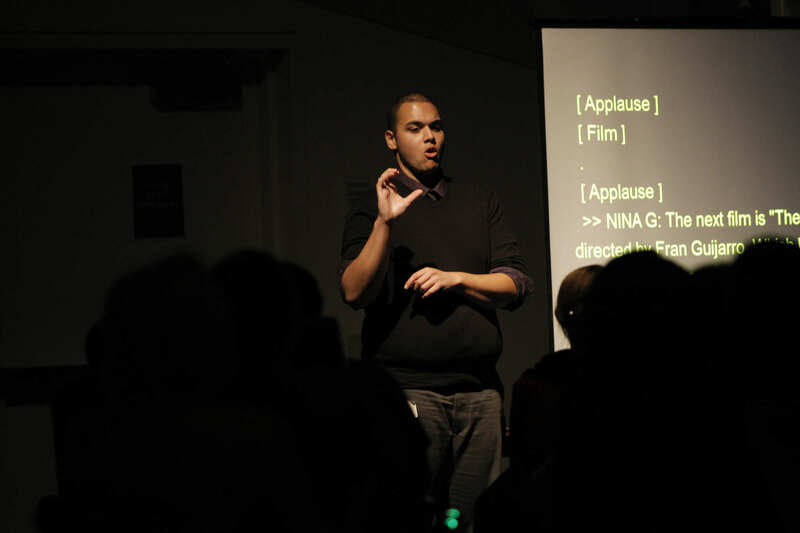 Samuel Leath, an ASL translator, does sign language for the crowd members at the Superfest International Disability Film Festival at the Contemporary Jewish Museum in San Francisco, Calif., Sunday, Nov. 2, 2014. Daniel Porter/Xpress. “Isn’t it nice to see a disabled man fail?” said Nina G, as the audience roared once again in laughter. Zach Reed, a man with Lyme disease who attended the event in a wheelchair, stated that despite the ending, the movie failed to show the other problems associated with Andrews’ disability, as well as his financial situation, that allowed him to pursue his dream. “If a film is going to be a good film, it should capture the humanity of the situation,” Reed said, adding that the movie focused more on the physical aspect of his disability and ignored the mental repercussions. He said the film should have followed up on Andrews’ PTSD from losing his friend. Despite his dislike of the mountaineer film, Reed said he enjoyed “Everything is Incredible,” a short film featuring a poverty-stricken Honduran man with polio who had spent over 50 years of his life building a helicopter. During the festival’s intermission, Bashin was found talking to audience members and discussing the festival, as well as the movies. Lighthouse and the Institute recently began hosting the festival after Culture!Disability!Talent!’s 15 year stint. Bashin said the two organizations were honored to have the responsibility of hosting future events. They started their first year by hosting an awards ceremony titled “The Dissies,” where people voted on the most regrettable representations of disabilities in film. However, this year they returned the event to its traditional format.